I love doing long, aesthetically pleasing rides, and loops tend to be the most aesthetic rides. No retracing of steps, constant new views, and no shuttling. In Colorado most of the loops go over several mountain passes, which just adds to their beauty. 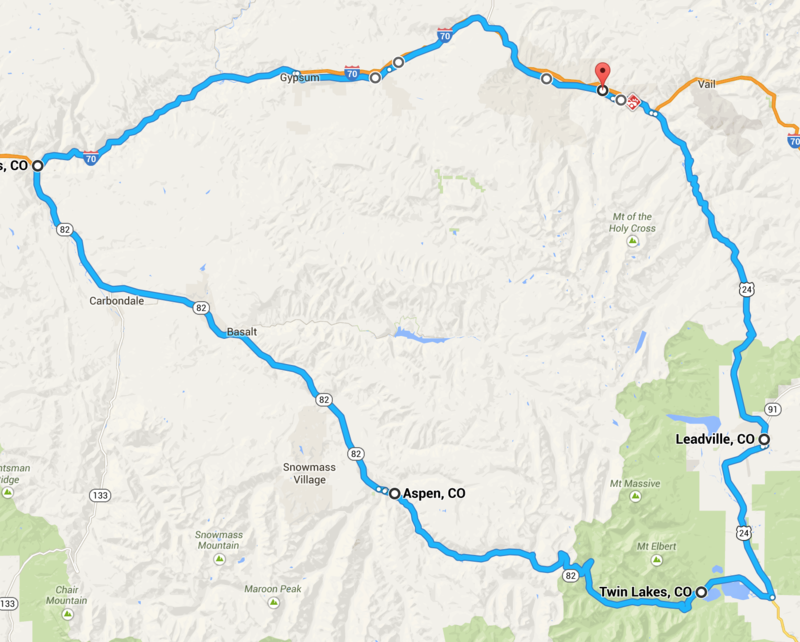 So here is a brief description of five big loops I did in Colorado. 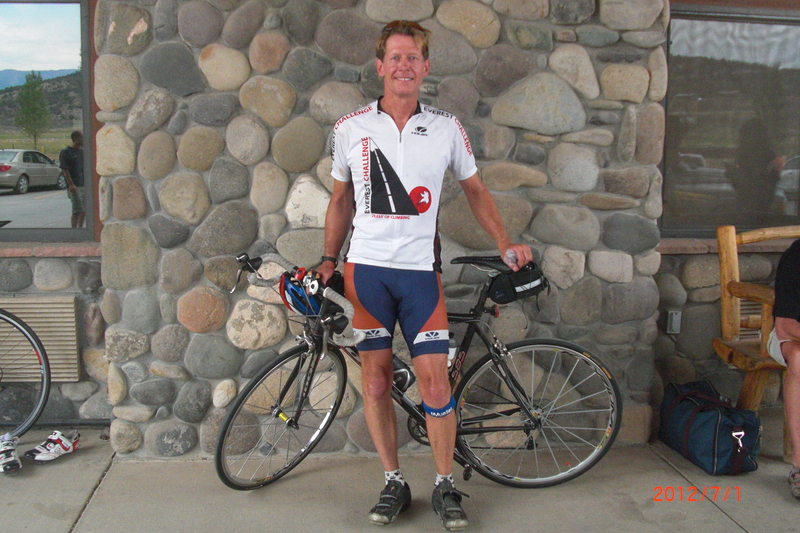 Apart from the Grand Loop, which I rode in 2008, all these were done in 2012, when I when I was fit from a wonderful June when I rode back-to-back the weeklong tours, Ride the Rockies, and Bicycle Tour of Colorado. These loop are long, so think about the clothing you will need, where you can get food and water, and consider fitting your bike with lights for early starts or late finishes. 200 miles, 15,500 feet of climbing. Most notably it goes through beautiful Rocky Mountain National Park and climbs over Trail Ridge Road, with a maximum elevation of 12,183 feet. It’s an obvious loop, but the route finding is not always obvious. I started this at the Morrison exit on I-70 so that I could ride from I-70 to Boulder in the early hours of the morning before there was any real traffic. Park at one of the parking lots at this intersection (perhaps at the Woolly Mammoth lot). Ride north on Highway 40 until just after Heritage Park, where you turn left onto Highway 93. Follow this to Highway 6 then turn left and follow this past Golden. Continue on 93 to Boulder. Make your way through Boulder (no easy ways unfortunately) and continue on Highway 36 to Lyons, then Estes Park. Turn left in Estes Park and continue on 36 into Rocky Mountain National Park. Continue on 36 until it joins Highway 34. Continue straight on 34 then up and over Trail Ridge Road. Ride down the west side of Trail Ridge, through Grand Lake and on to Granby. 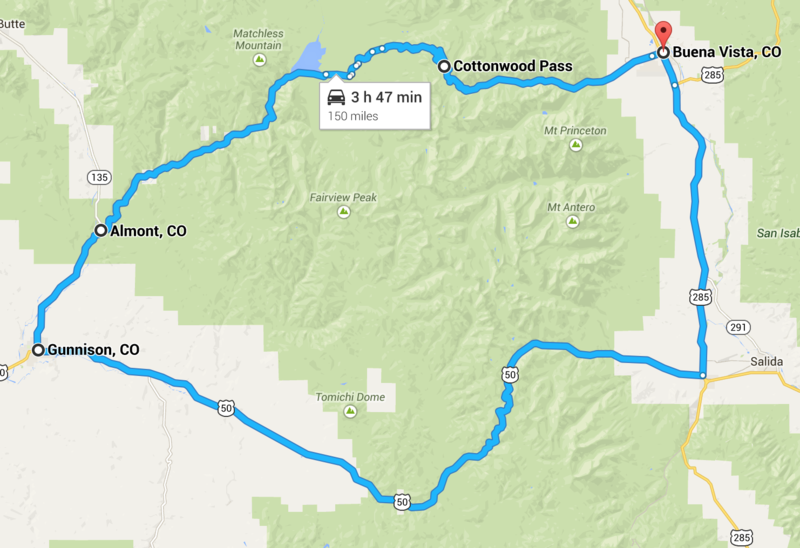 Continue east and south on Highway 40, through Fraser and Winter Park and climb Berthoud Pass (11,307 feet). Descend the other side and ride to Empire then I-70. Stay briefly on the north side frontage road of I-70 then continue along Highway 40 as it crosses under the highway to the south, then back again to the north. Continue through Downieville to Dumont, then after Dumont cross over I-70 and continue on the south side of I-70 until you reach Idaho Springs, where you will again go under I-70 to the north side. Ride through Idaho Springs along Colorado Blvd until it finally crosses I-70 then continue on the south side of I-70 along roads and bike paths to the top of Highway 6, leading down to Golden. Very soon turn right and climb steeply up the Highway 40 frontage road. Follow this on the left side of I-10 until it crosses near the Evergreen Parkway. Follow 40 then go east on Evergreen Parkway until you are forced onto I-70. Ride on this to the Genesee Park exit, then cross over the freeway and continue on Highway 40 down to your car. 225 miles, 16,000 feet of climbing. This is an incredible ride. I’d done all the parts of it on other rides, and even did the whole thing over four days earlier in the year with the Gut Grinders, and for a long time had thought it would be a magnificent one day ride. 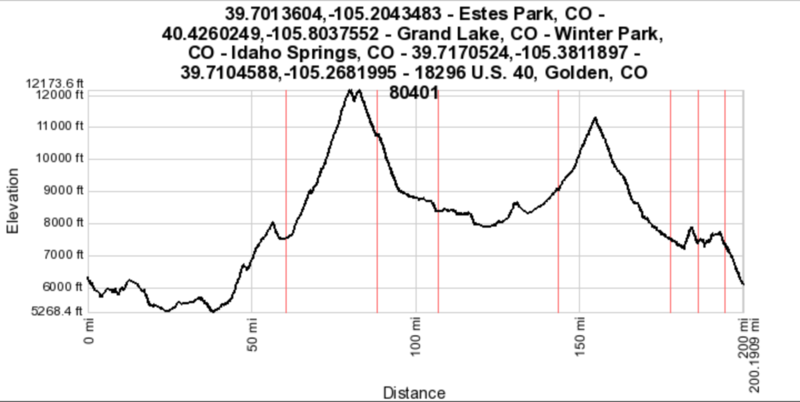 I discovered that Rocky Mountain Cycling Club organizes a ride over this loop as part of its Triple Crown Series. They give it the unfortunate name of the Colorado Death Ride – unfortunate because the Death Ride is the one in Markleeville, California. I suggested calling it the Death Loop but to no avail. You can obviously start it anywhere, but coming from Boulder the obvious place is Ridgway as that’s the closest to Boulder. That’s where we started in 2012 – at 2 a.m. From Ridgway, ride south through Ouray then up the Million Dollar Highway to Red Mountain Pass (11,018 feet). Descend into Silverton then climb Molas Pass (10,910 feet) and Coal Bank Pass (10,640 feet) then do a long descent into Durango. I stopped here for a second breakfast at McDonalds. Continue west on Highway 160, climbing over Hesperus Hill and onwards to Mancos. (There’s a bakery in Mancos that is famous for its chocolate coconut macaroons, and I stopped here for one.) 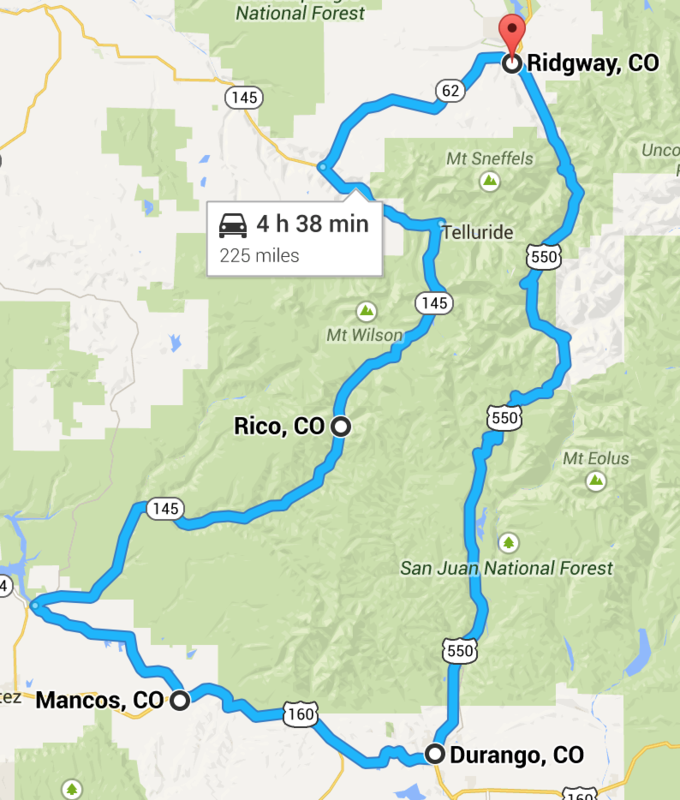 At Mancos, you leave 160 and turn right onto Highway 184 to Dolores. If you miss this you’ll end up in Cortez and have to ride Highway 145 north to Dolores. From Dolores ride east and north on Highway 145 through the little town of Rico. Continue up and over Lizard Head Pass (10,222 feet), down the other side past the turnoff to Ophir, then up another climb, then down to the main road leading into Telluride. 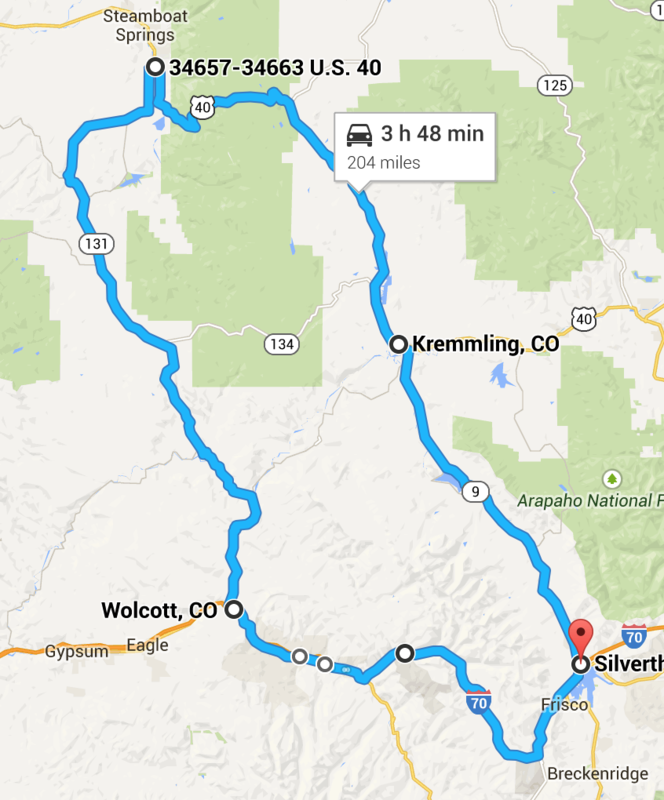 Instead of going into Telluride, turn left and follow 145 down the valley to Placerville. Turn right on Highway 62 and follow this east and north, over Dallas Divide (8,983 feet), back to Ridgway. 190 miles. This loop climbs two passes, the long and not too steep Tennessee Pass (10,424 feet) and then the mighty Independence Pass (12,095 feet). We started in Avon as there is good parking, and it’s about the closest place to Boulder. I rode this with my friend Jonathan Lagoe (he had never ridden a century before and he stopped in Glenwood Springs after an amazing 137 mile ride.) We parked in one of the large parking lots near the base of the road that heads up to Beaver Creek. 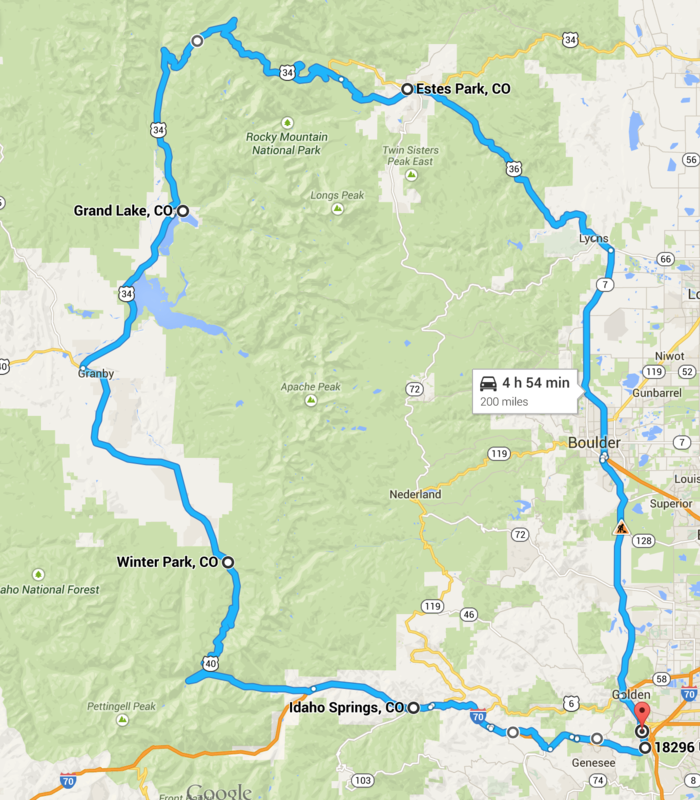 Ride east on Highway 6, then head right up Highway 24 to Minturn. After Minturn do the steep 4 mile climb to Battle Mountain. A fast descent takes you down towards Red Cliff and over the spectacular bridge over the Eagle River. Continue up the mainly gentle climb for about 12 miles to Ski Cooper at the top of Tennessee Pass, past the big meadows of Camp Hale, where the 10th Mountain Division lived and trained during Word War 2. After Tennessee Pass, do a short descent then follow rolling terrain to the short climb to the junction with Highway 91 (about 9 miles from Tennessee Pass.) Turn right and follow Highway 24 for 18 miles, through Leadville (at 10,152 feet, the highest incorporated city in the US), and down to the turnoff for Highway 82 to Aspen. Follow Highway 24 miles to the top of Independence Pass, with some big switchbacks towards the end. Another 20 miles of beautiful downhill leads you to Aspen. Then it gets boring. Follow Highway 82 for about 41 miles to Glenwood Springs. When we did it we had a strong headwind the whole way. Once in Glenwood Springs, the ride gets more interesting again. Cross the Colorado River then turn right and ride past the Hot Springs to where the bike path starts. Follow the bike path for about 16 miles through spectacular Glenwood Canyon. Then follow Highway 6 for another 37 miles back to Avon. 150 miles. I’d ridden Cottonwood Pass from the west many times on Ride the Rockies and Bicycle Tour of Colorado, but never from the east. It seemed that it would make a good loop, climbing Cottonwood Pass (12,126 feet) and Monarch Pass (11,312 feet). I parked at the park on the right as you head west up Highway 306 from the center of Buena Vista towards Cottonwood Pass. 19 miles of riding west takes you to the top of Cottonwood Pass, with lovely switchbacks to finish. From here it’s about 14 miles of good dirt road down to the paved road at Taylor Park Reservoir. After riding 10 more miles into Gunnison, turn left at Highway 50 and ride 32 miles on rolling terrain to the little settlement of Sargents, where you can get food before the big climb up magnificent Monarch Pass. Another 10 miles and you reach the top of the pass. 17 miles of downhill and flat riding down the easier east side of Monarch Pass take you to Highway 285, just outside Poncha Springs, where you turn left and head north for about 24 miles along Highway 285 back to Buena Vista. When I did it I had a ferocious headwind on this section, which was a slow and painful way to end the day. 203 miles. What a lovely loop, climbing Vail Pass (10,662 feet) and Rabbit Ears Pass (9,426), with beautiful country all the way. The passes are not quite as high as on the other loops but there’s plenty more climbing besides the two passes – in particular climbing out of Wolcott and out of State Bridge. I started very early and was a bit nervous about where to park, and ended up parking in the parking lot almost across from the Silverthorne Rec Center on Rainbow Drive. Ride south on Highway 6, under the Interstate, and up to the Dillon Dam Road. Turn right on this and follow the dam road to its end. Turn left and ride 1 mile down Highway 9 into Frisco then turn right and follow Main Street for about 0.8 miles to the entrance to the bike path on the left. This is just after Creekside Drive on the right. If you intend to do this in the dark, as I did, it’s worth familiarizing yourself with the entrance beforehand. Follow the bike path right and up to its end at Highway 91 at Copper Mountain. Cross Highway 91 and follow Copper Road for 1.4 miles to where the Vail Pass bike path heads off to the right. Follow the bike path easily up the east side of Vail Pass, then more steeply down the west side. Once you reach the paved road, follow it through East Vail, Vail, and West Vail down to the bike path that leads to Highway 24 to Minturn. Turn right and follow Highway 6 as it passes through Eagle-Vail, Avon, and Edwards, then crosses under I-70 and continues to Wolcott. Turn right at Wolcott and start climbing again up Highway 131. After about 13.5 miles you’ll reach State Bridge, at the bottom of a long steep descent. From State Bridge start climbing again and continue through McCoy, Toponas, Yampa, and Oak Creek until about 69 miles past Wolcott you will reach Highway 40 just south of Steamboat Springs. Unless you need to refuel in Steamboat, turn right on Highway 40 and ride up to the west summit of Rabbit Ears Pass. Continue along high rolling terrain to the east summit then descend over Muddy Pass and continue along rolling and slightly downhill country to Kremmling, about 48 miles from the intersection of 40 and 131. At Kremmling, turn right onto Highway 9 and continue along this, climbing very gently for about 37 miles back to Silverthorne.